When we got home I found a place for some of the old things of hers that I saved, just like I had the other times. The marble bookends are functional – I won’t have to buy a set now – and went right on the shelf to hold back the heaviest rows of books. The chipped ceramic fruit sculpture is too tall to fit on top of my kitchen cupboards, but it can sit on the counter for a while. The painting – just a print, but it’s framed – that space on the wall is just the right size. I put the photo album containing pictures of her on the floor next to the bins of old photos that I haven’t yet found a place to store. So many hands had turned the pages of that photo album over two days, so many memories and stories and questions prompted by those old pictures. I need a few days before tackling the project of putting those eighty-some photos back in their original albums. I’m not ready yet. It’s already been a few days. A few days since my mom called and said “Grandma died last night.” A few days since I kissed my thirteen year old on the cheek and said it’s okay, you don’t have to go to the funeral, Grandma would have wanted you to have fun with your friends. A few days since watching my fifteen year old act as pallbearer for the first time. A few days since being thrust into the world of my childhood again, of seeing old friends and relatives and introducing my family to people who knew me when I was little and who don’t know my kids who aren’t little anymore. A few days since trying to tell a roomful of people through a shaking voice everything that a Grandmother’s life means. The book of photos sits on the floor in my office next to the piles of rifled-through picture albums, little post-its sticking out where the photos of her belong. I’ve been here before. This is the third time I’ve done this and the third time I’ve written this post in just under three years. I’m not ready to put the pictures back yet. Loss is hard to bounce back from, even if it’s expected, even if it’s a blessing like we all say, only half trying to convince ourselves. Being left is always harder than leaving. I think if we had the choice we’d keep the ones we love the most close forever. My last Grandma was buried last week, joining the others of that generation on my side of the family who lived this life and have gone on to the next. Bittersweet, sad, and real – the death of a loved one and the ensuing events of funeral, burial, and memorial serve to heal and cleanse as tears are shed, acquaintances regenerated, memories recalled, and life goes on. The time comes quickly, and blessedly ends just as fast, leaving us each with different tasks of wrapping up, cleaning out, and putting into place. It takes time. Way more than a few days. OH, my heart. I am so sorry. When I lost my only grandmother, I couldn't bear the heart ache. Peace and love to you. And this tribute, how she is delighting in it right now, Andrea. 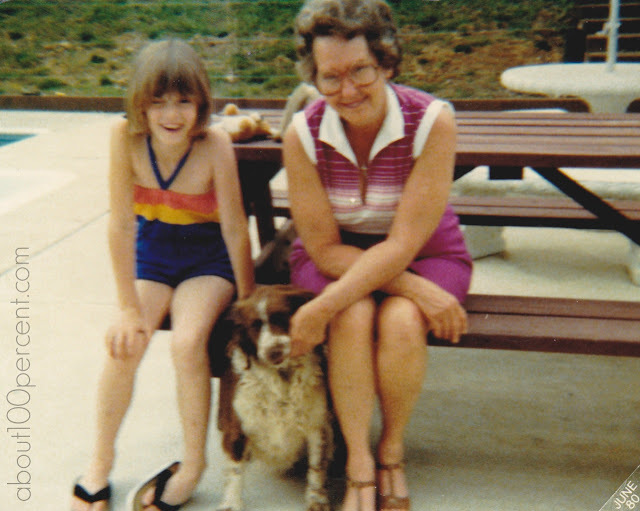 I lost my grandmother, the only grandparent I had ever known, when I was two months pregnant with my youngest daughter. She is named after her. Love you, friend. I'm thinking about you, and yes, take all the days you need.